Magma Flow is one of the Star Sprint courses found in Mario Party 6. It can be bought for 50 Stars in the Star Bank. Players must avoid obstacles such as fire, and dodge Bullet Bills shooting out of a cannon. Then, the player faces a burned portion of the road. 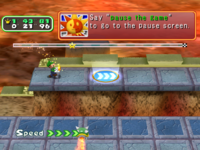 To pass, the player must call the party using the command "Mario Party" with the microphone, and order them to cool the road. The player then faces more obstacles before finding a locked door. Using the same previous method, the allies knock the door down. Finally, the player reaches the finish line. This page was last edited on December 13, 2017, at 16:36.